These cutters are ideal for use with a range of Edible and Non-Edible materials including: sugarpaste (rolled fondant), petal paste (gum paste), marzipan and craft clays. 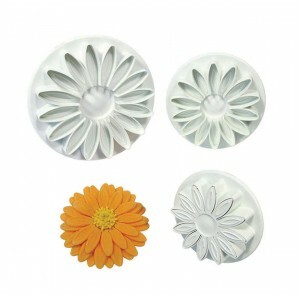 Create simple-to-produce flowers in four sizes. .. These cutters are ideal for use with a range of Edible and Non-Edible materials including: sugarpaste (rolled fondant), petal paste (gum paste), marzipan and craft clays. 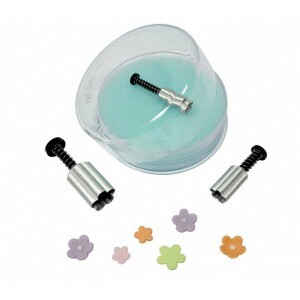 Create simple-to-produce flower blossoms/forget-me-nots in three sizes. .. These cutters are ideal for use with a range of Edible and Non-Edible materials including: sugarpaste (rolled fondant), petal paste (gum paste), marzipan and craft clays. Create beautiful Garrett Frills that are ideal for side designs, fabric effe.. 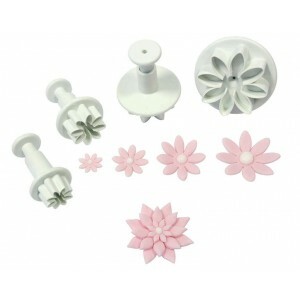 These cutters are ideal for use with a range of Edible and Non-Edible materials including: sugarpaste (rolled fondant), petal paste (gum paste), marzipan and craft clays. Create simple-to-produce heart shapes in three sizes. .. These cutters are ideal for use with a range of Edible and Non-Edible materials including: sugarpaste (rolled fondant), petal paste (gum paste), marzipan and craft clays. Create simple-to-produce three-leaf holly in two sizes. .. These cutters are ideal for use with a range of Edible and Non-Edible materials including: sugarpaste (rolled fondant), petal paste (gum paste), marzipan and craft clays. Create simple-to-produce rabbit shapes in two sizes. .. These cutters are ideal for use with a range of Edible and Non-Edible materials including: sugarpaste (rolled fondant), petal paste (gum paste), marzipan and craft clays. Create simple-to-produce star shapes in three sizes. .. 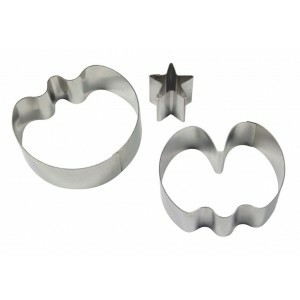 These stainless steel cutters are ideal for use with a range of Edible and Non-Edible materials including: sugarpaste (rolled fondant), petal paste (gum paste), marzipan and craft clays. Create simple-to-produce sweet peas in two sizes. .. These cutters are ideal for use with a range of Edible and Non-Edible materials including: sugarpaste (rolled fondant), petal paste (gum paste), marzipan and craft clays. Create simple-to-produce teddy bear shapes in three sizes. .. These cutters are ideal for use with a range of Edible and Non-Edible materials including: sugarpaste (rolled fondant), petal paste (gum paste), marzipan and craft clays. Create simple-to-produce teddy bear shapes. .. 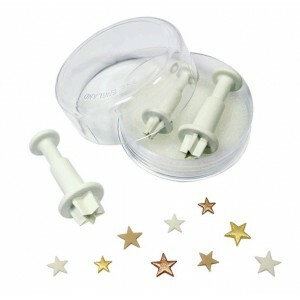 These cutters are ideal for use with a range of Edible and Non-Edible materials including: sugarpaste (rolled fondant), petal paste (gum paste), marzipan and craft clays. 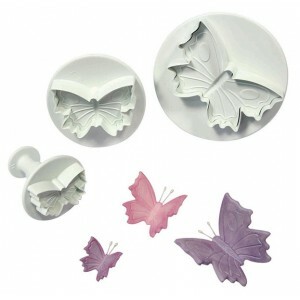 Create simple-to-produce butterflies complete with detailed veining in .. These cutters are ideal for use with a range of Edible and Non-Edible materials including: sugarpaste (rolled fondant), petal paste (gum paste), marzipan and craft clays. 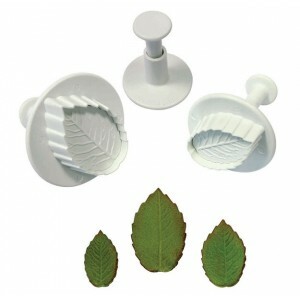 Create simple-to-produce leaves complete with detailed veining in 15mm, 22mm.. This cutter is ideal for use with a range of Edible and Non-Edible materials including: sugarpaste (rolled fondant), petal paste (gum paste), marzipan and craft clays. Create simple-to-produce leaves complete with detailed veining 28mm. .. This cutter is ideal for use with a range of Edible and Non-Edible materials including: sugarpaste (rolled fondant), petal paste (gum paste), marzipan and craft clays. Create simple-to-produce leaves complete with detailed veining 22mm. .. This cutter is ideal for use with a range of Edible and Non-Edible materials including: sugarpaste (rolled fondant), petal paste (gum paste), marzipan and craft clays. Create simple-to-produce leaves complete with detailed veining 15mm. .. These cutters are ideal for use with a range of Edible and Non-Edible materials including: sugarpaste (rolled fondant), petal paste (gum paste), marzipan and craft clays. Create simple-to-produce leaves complete with detailed veining. .. 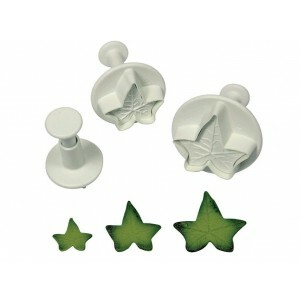 These cutters are ideal for use with a range of Edible and Non-Edible materials including: sugarpaste (rolled fondant), petal paste (gum paste), marzipan and craft clays. Create simple-to-produce flowers complete with detailed veining in three siz..